Should Domonic Brown be on Mets’ radar? The swell of players in spring training is too much for a 25-man roster to handle. As a result, trades made in advance of Opening Day often include diamonds in the rough, due to lack of options and other factors. Could Domonic Brown be one of those gems? 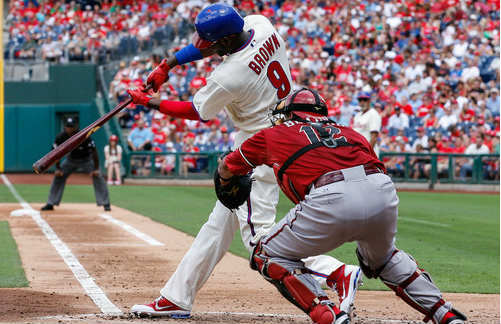 It’s no secret the Phils have soured on Domonic Brown. The signing of Delmon Young, who appears to be the front-runner for the right field job that was seemingly Brown’s job lose most of the winter, is just the latest, perhaps most damning development in Brown’s fall from grace, and the Phils now long running disenchantment with their former top prospect. While Brown still has a chance to win significant playing time with the Phillies this spring, Laynce Nix, Darin Ruf, and John Mayberry Jr, are all in the mix for the Phils left field job as well. As a result, it certainly wouldn’t shock anyone to see the Phillies finally trade Brown; he’s been connected to just about every major Phillies trade rumor over the last three years. Most likely, Brown isn’t going anywhere in the next few weeks, and will be given every opportunity to showcase his talents this spring. But if Brown doesn’t secure at least the better half of a platoon in left this spring, it’s hard to see the Phillies relegating him to a bench role, or sending him back to AAA for a fourth straight season. Yes, the Mets aren’t exactly lacking in left-handed hitting outfielders with questions marks; make no mistake, Brown has plenty of them. By a variety of measures, however, Brown is also being seriously undervalued by the Phillies, and his odds of becoming a productive big league outfielder are probably better than either Lucas Duda or Kirk Nieuwenhuis. While Brown has hit just .236/.315/.388 with a .307 wOBA in 492 plate-appearances over career, it’s easy to see why they all share such a bullish outlook on him. Brown’s career BABIP is .269- about 30 points below the league average- despite the fact there is nothing about his batted ball profile that suggests he should struggle in that department. Further, despite his lack of production, Brown’s plate discipline has remained very good at the big league level. He has a 51:93 BB/K ratio for his career. It’s also worth noting that Brown suffered a broken hamate bone in the spring of 2011. Hand and wrist injuries are known to linger for awhile and sap many hitters of their power — which would certainly explain Brown’s unimpressive SLG% in both AAA and the big leagues the past two seasons. Throw that on top of the fact has just generally been jerked around in terms by Charlie Manuel and co. in terms of playing time and his role in the organization. Of course, Brown’s reputation as an atrocious defender has done even more damage to his prospect status than his disappointing offense. While Brown — who was recruited to play wide receiver at the University of Miami — is absolutely oozing with athleticism and has no trouble covering a lot of ground, it’s been well documented that his routes in the outfield leave much to be desired. This sentiment was also reflected in the limited defensive data on Brown from 2010-2011. In 2012, however, Brown did show some improvement defensively in the eyes of many evaluators, and this is reflected (again, small sample size beware) in his much improved UZR last season. So make of that what you will. I’m admittedly in no position to judge Brown’s defense, or the extent to which player’s defensive instincts are simply intrinsic. But keep in mind that Brown just turned 25 years old, and was very raw when he was drafted out of high school in 2006, so it’s conceivable he’s finally learned to translate his raw tools into production in the outfield. In other words, Brown looks like a young, undervalued, high-ceiling talent. Exactly the type of asset the Mets should look to acquire. Of course, 28 other teams could also use an infusion of young, undervalued, high-ceiling talent, but Ruben Amaro doesn’t seem to think the Phillies do, so there’s that. What do you think? Is Domonic Brown a player the Mets could use? If he becomes available, should the Mets try to acquire? Why or why not? Answer in the comments. Good question…..but I vote no. I do think they brought him up a little too early in his development but to me, it’s very telling that the Phillies brought in other options to compete against him. Doesn’t sound like they’ve got much confidence in him either. I’m not sure his defense will improve enough to be even average – and Citi Field is bigger than CBP. I know this is just the type of player Sandy is often looking for. If he would consider it, I’m willing to bet he’s not giving up much in the way of better prospects to acquire him. It’s also worth noting that Brown suffered a broken hamate bone in the spring of 2011. Hand and wrist injuries are known to linger for awhile and sap many hitters of their power — which would certainly explain Brown’s unimpressive SLG% in both AAA and the big leagues the past two seasons. Uh. no – if you look at data hamate bone injuries do not usually affect a hitter for two full seasons. One? Yes. Two? No. Stupid statements can be corrected. Being Yoko Ono, however, cannot. Could you please be a little more helpful and provide the data to which you refer? Further, can you provide evidence that every single hamate bone injury, surgery, and recovery are exactly the same? There’s a pretty good chance that Brown’s wrist/hand was 100% by the end of 2011 or the beginning of 2012. However, the missed time may have stunted his development. Further, he might have picked up a bad habit as a result of the injury that has yet to be corrected. Some injuries take even longer to heal. I still haven’t recovered fully from Yoko causing the Beatles to break up 40 something years ago.